(TORONTO – December 19, 2013) Toyota’s popular Highlander mid-size SUV has been re-imagined for 2014 – from top to bottom, inside and out. The all-new Highlander features a striking new design, additional comfort, and improved drivability with a choice of power trains. And for 2014, Toyota Canada is offering the new Highlander in four models – with more features and amenities than in previous years, and all with suggested starting prices at or below the MSRP on 2013 models. The 2014 Highlander sets a new standard for mid-size SUVs based on the comfort and drivability of a passenger car (unibody) platform. First impressions are important, and the new Highlander features a strong and sleek exterior. Dynamic styling starts with a striking trapezoid grille and continues into a lower, wider, longer body with a lower centre of gravity. The new exterior features more rigid body construction to reduce noise and vibration. The new Highlander is more stable on the road and drives more like a passenger car than ever before. Electric power steering and a finely-tuned suspension deliver smoother lane changes and better cornering, while a new six-speed transmission offers smooth shifts and confident acceleration, making the Highlander more fun to drive while maximizing fuel efficiency. All 2014 Highlander models feature a 3.5 L V6 engine, and come with standard Front-Wheel-Drive (FWD) or available All-Wheel-Drive (AWD). Inside, the 2014 Highlander features a beautiful, functional interior with more comfort for driver and passengers. The third-row seat has space for three people, making Highlander one of the few eight-person models in the segment. It’s more comfortable than in previous models, too – with more hip room. It’s easier to get into and out of, rear seats that can be folded away with a single touch. Other interior improvements include: 34 percent more cargo space behind third row seats than the previous generation; a special shelf on the dash designed specifically for personal electronics; a console box between the front seats designed to hold a large tote bag; and the available Easy Speak system, which facilitates conversation between those in the front and rear seats. Standard features in all 2014 Highlanders include a 6.1” display audio system with USB and auxiliary input, Bluetooth® connectivity, voice recognition and steering wheel-mounted audio controls; dual-zone (front and rear) climate control; power door locks with keyless entry; power windows with driver and front passenger auto up/down function; tilting/telescoping steering column; plenty of thoughtful in-cabin storage; reading lamps and cargo-area lamp; 12v DC accessory power outlets and retained accessory power; a power assisted rear door closer; power adjustable exterior mirrors with integrated signal lamps; front windshield de-icer; rear spoiler; and more. The new Highlander also maintains Toyota’s no-compromise commitment to safety. In addition to eight airbags, all 2014 Highlander models are now standard equipped with a back-up camera, connected to a larger display in the console for even better visibility. Additionally, available safety technologies include Toyota’s Blind Spot Monitor with Rear Cross Traffic Alert System. As with every new Toyota since 2011, the 2014 Highlander is standard equipped with the six active safety technologies of the Star Safety System: Antilock Brake System, Brake Assist, Electronic Brake-force Distribution, Vehicle Stability Control, Traction Control and Smart Stop Technology work together to help drivers avoid potential accident situations. The new front wheel drive Highlander now features a V6, replacing the 4-cylinder engine in the previous generation. This delivers up to 270 horsepower – significantly more than in previous generations – for better performance. Other enhancements include the latest generation of Toyota’s 6.1” Display Audio system, 18” alloy wheels and a towing package rated at 2,268 kg (5,000 lb). The new front-wheel-drive Highlander with V6 has the same starting from MSRP as the 4-cylinder engine in the previous generation. This model may be ordered with the available Convenience Package, which adds popular upgrades including: eight-way power-adjustable driver’s seat; fog lights; power rear door with jam protection; a flip-up glass hatch on the rear door; heated front seats; leather-wrapped steering wheel and shift knob; three-zone independent automatic climate control; and more. This Highlander offers the same full feature set as the front-wheel-drive model, plus the added all-weather confidence of a new all-wheel-drive system featuring Dynamic Torque Control with downhill assist control (DAC) to improve efficiency, performance and drivability. For 2014, this model is priced $1,880 below its 2013 equivalent, even after the addition of more standard equipment including 18” alloy wheels and a back-up camera. The Highlander XLE builds on the LE model with several additional features as standard. These include: leather seat surfaces; eight-way power-adjustable driver’s seat; fog lights; power rear door with jam protection; a flip-up glass hatch on the rear door; heated front seats; leather-wrapped steering wheel and shift knob; power moonroof; three-zone independent automatic climate control system; a larger, 4.2” colour multi-information display linked to audio system; integrated garage door opener; roof rails with crossbars; and more. New for 2014, this model now features the AVN Premium navigation system with a larger 8” touch-screen; rear door sunshades and the Toyota Smart Key System with Push Button Start – all for a starting MSRP $175 less than the popular 2013 Sport model. The Highlander Limited builds on the XLE model, creating a premium mid-size, 7 passenger SUV that stands out from the competition. In addition to XLE features, standard features on the Limited model include: a 12-speaker JBL Synthesis Audio system; perforated leather seat surfaces; front heated and ventilated seats; a driver’s seat/mirror memory system; auto up/down function on all windows; woodgrain interior trim; front doorsill trim with aluminum accents; steering wheel-mounted HVAC controls; roof rails with chrome trim and cross bars; and more. New for 2014, this model now features: a heated steering wheel; heated 2nd row captain’s chairs; a panoramic moon roof; interior LED ambient lighting; 19” chrome-clad alloy wheels; clearance sonar system; and Toyota’s Blind Spot Monitor with Rear Cross Traffic Alert safety systems – all for a starting MSRP that’s unchanged from the equivalent 2013 model. 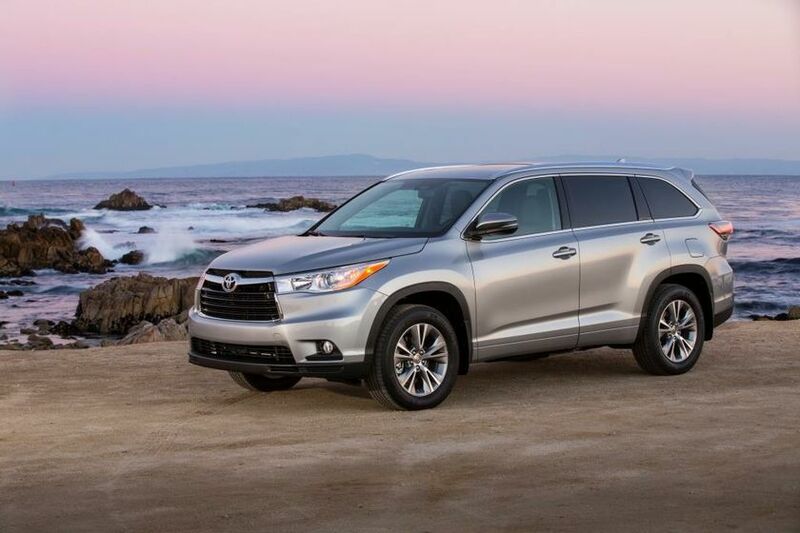 The 2014 Toyota Highlander will go on sale in early 2014 at Toyota Dealers across Canada.